It was a cute and charming as I'd hoped. Not a single complaint, everything was perfect. I wish my trip had been longer. Friendly staff, rooms neat and organized. Nice location. The hotel was absolutely fabulous! Definitely recommend the bunk rooms if you're a couple, there's more floor space. This hotel will be our go to spot from now on! Small and simple. Everything you need. We loved it! Small rooms but very compact and cute. All your needs are in the room. close to everything, great price, friendly staff. simple and all you need. Nice, clean, efficient, comfortable. Great location. Close to shops, restaurants, cafes, and subway. Great locale, great staff, good value. Would stay again. Where nice hotel. Loved the things they did with the place. The possibilities to sit outside. The launching areas in between the floors were really cool. The bar with beer garden was so much fun. I had a brief stay, but loved the area of the hotel. Wish I could have stayed longer to enjoy the court yard area. The room was clean and has central AC. Pod Brooklyn is in a pretty trendy neighborhood so there's tons of great food and stuff to do right around it. It's only about 6 blocks walk to the L to get back into Manhattan, so it worked great for us to check in quick before going back to Midtown for a show. Rooms are small but very modern and everything is shiny and new. Rooftop bar is really nice! Located in Williamsburg, Pod Brooklyn is within a few miles (5 km) of popular sights such as New York University and Brooklyn Bridge Park. This 3-star hotel has 249 guestrooms and offers conveniences like a restaurant, free in-room WiFi, and a rooftop terrace. You can enjoy a drink at the bar/lounge or visit the onsite restaurant for a bite to eat. Start each morning with continental breakfast, available for a fee from 7:00 AM to 11:00 AM. Guests can enjoy a flat-screen TV and stay connected with free WiFi and wired Internet. The bathroom offers hair dryers and free toiletries. Other standard amenities include a safe and a desk. 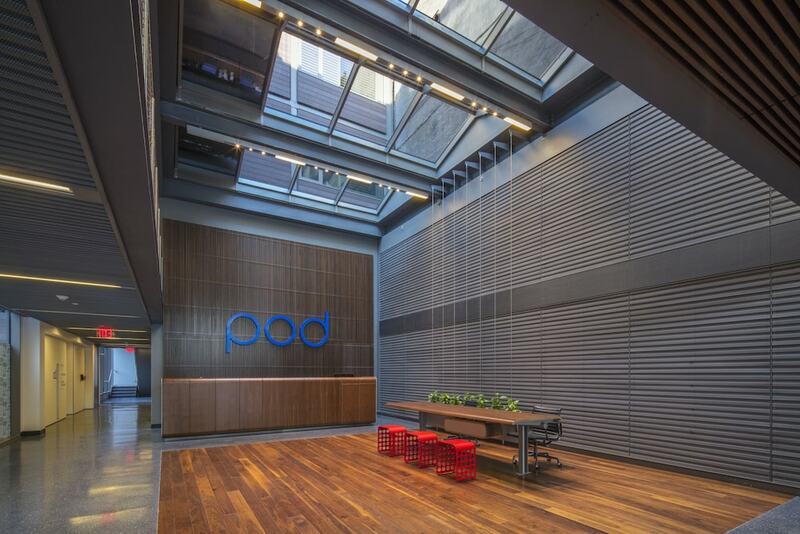 Guests staying at Pod Brooklyn enjoy a rooftop terrace, free WiFi in public areas, and a garden. Onsite parking is offered for a fee. The 24-hour front desk has multilingual staff ready to help with concierge services, and answer any questions about the area. This smoke-free hotel also has a porter/bellhop. Thanks for staying with us. We work hard to make our guests happy and appreciate your feedback! We hope to see you again soon. Continental breakfast is served daily from 7:00 AM to 11:00 AM for a fee.